Throughout the years I have created a lot of works on a big scale. Scale can be a powerful thing when it's used the right way. Not every canvas demands a really large canvas. When it does, it's not as easy as one would think. There's a lot of area to cover and a lot of elements to control. When it comes to the idea of scale and size, I don't think there is a better contemporary artist than James Rosenquist. Rosenquist began his career painting billboards during a time when billboards were actually painted instead of printed. It's difficult to give you an idea of the power and impact of his work if you have never seen it in person. The work above, Leaky Ride For Dr. Leaky from 1983 is a little over 16 feet long. It's enormous. There's no way to avoid being pulled in by the call of a work that large. This image shows one of the most monumental works by Rosenquist, Swimmer in the Econo-mist. It measures just over 90 feet in length. I have had the honor of seeing this work in person and I could have spent days going over it foot by foot. One of the great challenges of creating art on a large scale like these is finding a home for them. Most people don't have a 30 or 90 foot wall available in their homes. That leaves public collections or corporate collections. These can be a lot more difficult and it's not as satisfying to me to have my works in an office hallway as opposed to hanging in the home of a collector. Regardless, I still have the yearning to create these big works myself. Over the years, they have gotten larger and larger. 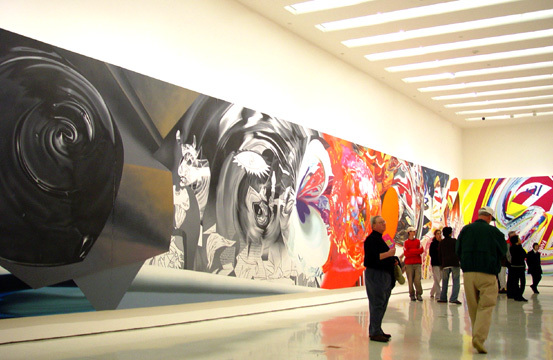 Although I don't think my work will ever come close to the enormity of Rosenquist, he provides plenty of inspiration.